Moto X3M, Hit the beach and race your way across the sand on this awesome bike before time runs out. 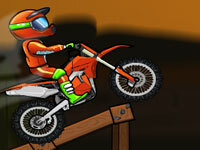 Moto X3M is a cool motocross stunt game. With 22 challenging, yet addicting levels. Put on your helmets, reeve your motorcycle and take off to beat the time on all the amazing stages. Perform tricks, like flips, to decrease your time. Moto X3M | Kizi - Online Games - Life Is Fun! Do crazy tricks on some very goofy dirtbike tracks!